Sofrito is ubiquitous in Caribbean cooking. One could safely say that Puerto Rican cuisine would be wanting without it. It is an aromatic mix of herbs and spices that is a base for cooking countless criollo dishes. This concept can be found in other cultures as well. One example is the Indian mix called garam masala which is also used as a base flavoring. Or kimchi, the fermented cabbage condiment, so popular in Korean cooking. The word sofrito is a generic term that has no correct English translation. “Frito” in Spanish means fried. Sofrito could be taken to mean stir-fried. Although this would not be entirely accurate. As the recipe shows, sofrito can be whipped up in a few moments’ time in a blender or food processor. And it can be stored in a closed tight jar the refrigerator for three to four days or, in the freezer compartment, indefinitely. Combine all ingredients in a blender and puree until it has a smooth, sauce-like consistency, adding 1 tablespoon vegetable oil (or olive oil) while pureeing. This will yield about 1 1/3 cups of sofrito. Store in a tight jar in the refrigerator. I prefer to place the sofrito in an ice tray. That way, I can use one cube or more as needed rather than have to scoop it out of the jar with a spoon. Wash rice under cold running water and drain to rid it of starch. In a heavy kettle or pot (I prefer cast iron), heat olive oil over medium heat. Add sofrito and tomato paste and sauté for about 3-4 minutes. 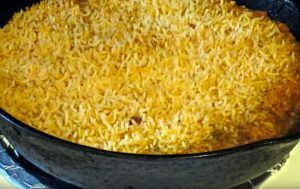 Stir in rice so that it attains a uniform color. Add water to cover rice by ¼ to ½ inch. Add salt and bring to a boil. Cover and simmer on low heat until water is absorbed and rice is tender, about 20-30 minutes. Remove from heat and let stand about 5 minutes before serving. Making Sofrito, for Puerto Rican Cuisine in America, and Also how to make Spanish Rice as well as Puerto Rican Rice. One of the ingredients : Recao ,.. it is hard to find sometimes !